The tested shotgun is Browning's Euro Field 20 gauge O/U, essentially the spitting image of the recently reviewed Cynergy Euro Field 12 gauge. For starters, let's get the basic Browning specifications on the board. Nominal Drop at Comb: 1-1/2 in. Nominal Drop at Heel: 2-3/8 in. There really isn't much difference in this 20 from its 12 gauge bigger brother in the cosmetic department, except for the engraving scenes of quail and grouse displacing the 12's pheasant and duck artwork. A fairly length dissertation was presented along with the 2007 review of the Classic Field 20 gauge Cynergy, so I won't repeat the history of the model here. You might want to reference that review for a more thorough discussion of the action and its background. I was favorably impressed with the action back then and I still am today. It is a wondrously slim, low profile action which was Browning's goal from the start. The design of the Cynergy action and its forearm hardware is such that it really is never going to look like a Citori, as it just isn't remotely the same. That is going to be both good and bad to the more stodgy, conservative hunters and shooters. For those who feel that a Browning Citori is the way an O/U needs to look, or should look for that matter, I can't disagree. There's nothing that looks more like a Citori than a Citori of course and based on the continual freshening and refreshening of the Citori line, the Citori just isn't going away. The Citori passed the 1,000,000 production mark in 2008 and is currently offered in over twenty-five different versions. Suffice it to say if the Superposed / Citori platform is the look and feel that drives you, there are a huge number of options for you right there. Why would you want or prefer a Cynergy? Well, I prefer the Cynergy platform as a generality, and it isn't because I'm especially compelled by the looks. I am enchanted by the lighter, slimmer action, its lighter weight, faster handling, and faster shouldering. The more standard (if you want to call it that) Cynergy Classic 20 was an enjoyable shotgun with 7/8 oz. Loads, but beyond that it became uncomfortable for extended shooting. The Inflex-pad equipped Euro Field Cynergy is softer shooting, to be sure, both with 1 oz. AA's and the extremely fast (for a 20 gauge) Kent Tungsten-Matrix 1-1/8 ounce three inch loads I decided on for pheasants. 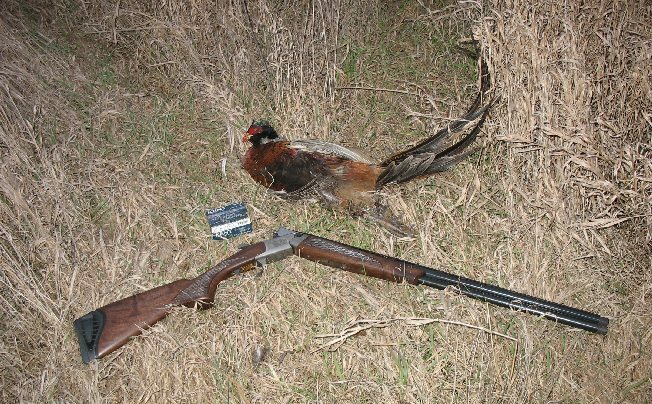 I've never liked the patterning performance of factory Browning tubes, so I lost those right away for the far better performing Trulock Precision Hunter extended choke tubes, opting for Full over Modified for pheasants. 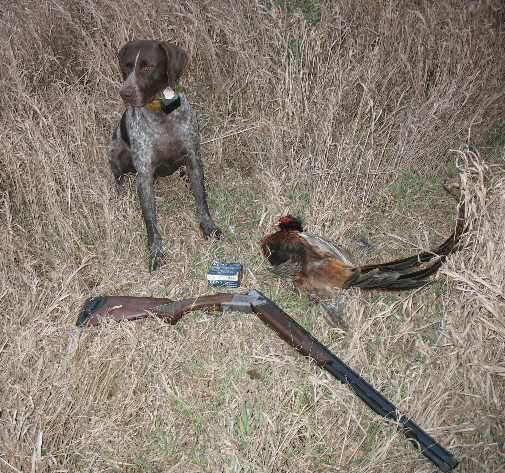 It didn't take Buddy the WonderDog all that long to send a cackling rooster skyward, and the Kent Tungsten Matrix #5 shot load dropped it instantly at about 40 yards, dead in the air and with two broken legs to boot. That's the beauty of the this Cynergy Euro Field-- it shoulders instantly, instinctively, and you shoot with your eyes just like it should be with no conscious effort. I like it and I like it better than the Classic Field version. Kent Tungsten Matrix Loads continue to do a fine job dropping birds. The 1-1/8 oz. three inch 20 gauge loads of #5 shot at a peppy 1360 fps leaves them dead in the air at 40 yards. I had one basic gripe about the previously tested Cynergy 20: the triggers were just too darn heavy. So, on this Cynergy Euro Field, it was a case of the less things change, the more they stay the same. The triggers are too darn heavy. The lower trigger breaks at six pounds on the nose, while the upper barrel trigger is heavier yet at six pounds, six ounces-- heavier than the gun itself. They are crisp and otherwise laudable. Yet, for a shotgun approaching $2700 of retail, I think it is reasonable to expect far better than average triggers. Out of the box, there is no reason for a trigger to be as heavy or heavier than the entire gun. The engraving and wood are touted as being substantially upgraded over the previous Cynergy. That is a bit of a maybe. The jeweled monobloc is there and the engraving is tasteful and attractive. The wood, called upgraded Grade II/III walnut is a bit more dubious. While nicely finished, well-balanced in color and tone, it isn't well-figured where I come from. It is darkly stained and attractive, but lacks what I'd call distinct mineral streaks, fiddle-back, or anything remarkable. Perhaps my impression is colored a bit by what Browning standard wood has generally been, that being far better than the average. The upgraded wood in this example just isn't more than a very tiny, incremental upgrade-- if indeed some would notice it as an upgrade at all. Browning includes a quarter-inch spacer to add to the buttstock length if you prefer. In my case, it was a very good thing. Without the spacer, the Cynergy didn't have enough drop for me: I saw rib. With the spacer, it fit beautifully. Another thing that Browning got right is the safety. On several field O/U examples, the tang safety is too smooth to allow for easy operation with gloved hands. With a pronounced center nub, this safety is quick and easy to get off or to put back on. This Cynergy is a fine-handling, pleasant to carry field gun with less felt recoil than most all stackbarrels in this weight category. Overall, it was hard not to like it with the my sole carping having to do with the overly heavy triggers. Browning can do a better job with them if they wanted to; apparently they just don't want to for legal reasons whether real or imagined. A trigger job will be in order for some owners, to be sure. The Cynergy low-profile action continues to impress, and though the gun does not comport to the rigid idea of a classic O/U, it just plain works better as a field gun-- far better than most and therein lies its greatest appeal.